Now that you have your Adventures in Diving certification, you may want to look at some of the deeper dive sites Minnesota (and the rest of the world) can to offer. The PADI Deep Diver Specialty course will give you the information needed to plan and conduct no-decompression dives to a maximum depth of 130 feet. PADI Deep Diver manual included and yours to keep. Prerequisite: PADI Adventures in Diving (or qualifying certification from another organization) and be at least 15 years old. Includes: PADI Deep Diver Specialty manual and certification processing. Read the PADI Deep Diver manual and complete the knowledge reviews. You also need to complete a PADI Student Record File (which includes a Medical Statement). If you answer yes to any of the medical history questions, we must require a signed physicians approval before you participate. You can download and review the PADI Medical Statement here. Please print a copy to take to your physician for their approval and signature if required. 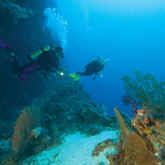 DAN Membership & Diving Accident Insurance programs.